It’s these kind of days that i’m eternally grateful to work from home. I literally stayed in my pajamas all day, worked in the basement, and ate chili for like 2.5 meals. If that’s not the life, I don’t know what is!? Maybe not working at all, and just eating chili all day? Yeah, that sounds pretty great. Shan and I were suffering from post-vacation-empty-fridge syndrome, so it was time to dig around the cupboards and freezer to see what we could conjure up. Ground beef, beans, a can of tomatoes, and a few others things led us to chili. Inspired by a multitude of recipes, I started by cooking the beans. You can definitely use pre-cooked, canned beans, but if you have dry beans and want to add some extra flavour, boil your beans in water with salt, a clove or two of garlic, half an onion, and whatever other flavours you think might be great (simmer them for about an hour until tender). The beans will soak up a ton of flavour and make a great addition to the chili, plus the water becomes a delicious, light broth. 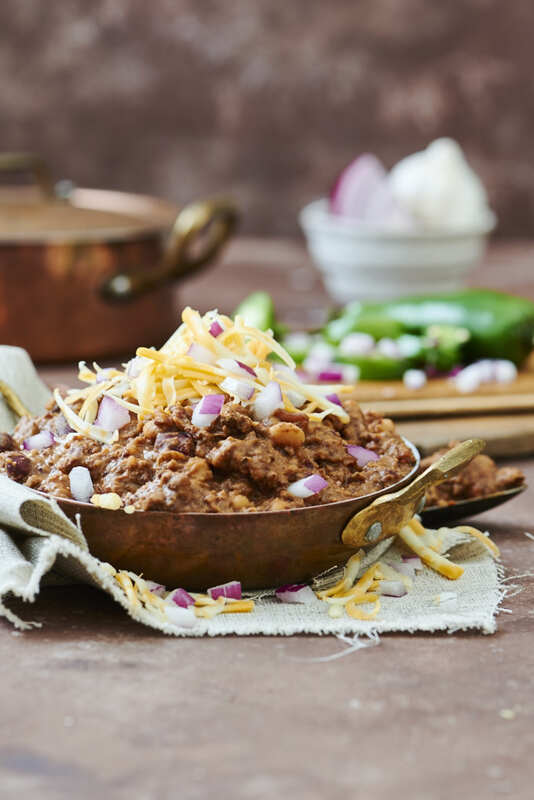 One of my favourite things about this chili, aside from the freshly ground Ancho Chili powder, is the use of pureed beans. While I love beans, I really dislike beef chili’s that have way too many of them. 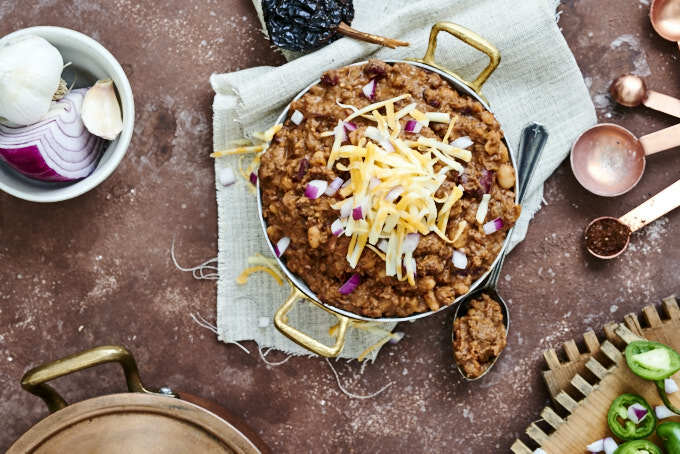 By using the bean puree, you get a super hearty chili with a nice texture, and some extra bean flavour without it being dominated by whole beans. Despite being a “throw-together” recipe, this may have been the best chili I’ve made to date! Even Shannon, who is somewhat anti-chili, had several bowls. 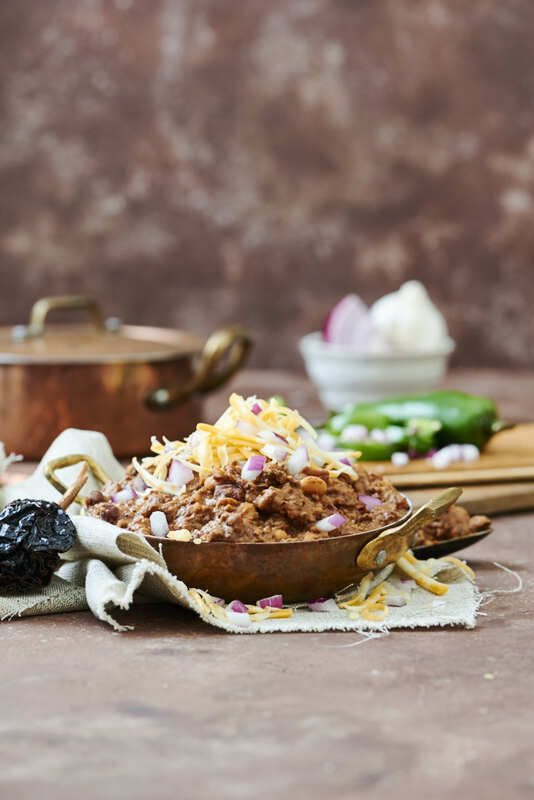 Freshly ground ancho chili peppers, beans, and beef, make this a hearty chili with the perfect amount of heat and smoky chili flavour. In a dutch oven, add olive oil and heat to medium-high heat. Once heated, add onion, shallot, and jalapeno pepper, cook for about 5-7 minute, until onions become fragrant and slightly translucent. Add ground beef, cooking for 5-10 minutes, stirring infrequently, allowing the beef to brown. Add oregano, cumin, ancho chili powder, salt, and pepper. Stir until spices are thoroughly mixed in, and cook for about 5 more minutes. In a blender, add 2.5 cups of cooked kidney beans and 2 cups of chicken broth, puree until a smooth paste forms. Add the canned tomatoes, bean puree, and whole beans to the dutch oven. Stir until all the ingredients are combined, reduce heat to medium. If the chili is too runny, continue to let it reduce until it reaches your desired consistency. If it's too thick, just add additional chicken broth. Allow to simmer for 5-10 minutes, adding any additional seasoning to taste, then serve. Chili tip–add roux browned to the color of toast at the end to thicken it. The difference is night and day.